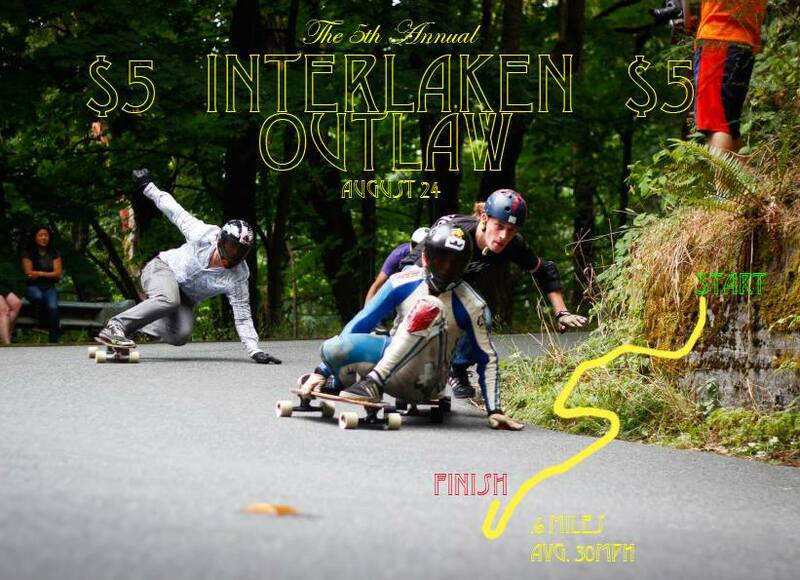 The 5th Annual Interlaken Outlaw race will be held on Sunday, August 24th. – Show up at the race site and walk towards the trail at the top of the hill near the 5-way intersection for registration. – Give the organizer 5 dollars and take a card with your number on it. – STAY ON THE STEPS WHERE YOU REGISTER UNTIL OTHERWISE DIRECTED. We want to limit our visibility as much as possible to avoid getting the race blown. – Practice heats will be run for a limited time. – DURING PRACTICE AND RACING WALK UP THE LONG TRAIL TO THE TOP. NOT THE USUAL SHORTCUT THAT LETS OFF ONTO THE LEFT HAIRPIN. IF YOU ARE FOUND USING THE SHORT TRAIL YOU WILL BE DISQUALIFIED FROM THE RACE. – After practice you will wait on the steps where you registered to be called for your heat. – If you are in the top two out of your four man heat, come back to the top for your next heat. GREEN FLAGS IN CORNERS MEANS CLEAR. RED FLAGS MEAN FOOTBRAKE TO A STOP AND GO BACK TO TOP TO RERUN YOUR HEAT. FRESH WHEELS WILL NOT BE ALLOWED. THOSE WHO SHOW UP WITH FRESH WHEELS AT THE START LINE WILL BE HANDED FLATSPOTTED/CONED WHEELS TO RACE WITH. FRESHNESS OF WHEELS WILL BE JUDGED BY ORGANIZER. A total of 10 volunteers will be needed. Please specify if you’re able to volunteer and provide your phone number on the forum or through a personal message. If you do not know how to get to the race site. Google Interlaken Park for directions.